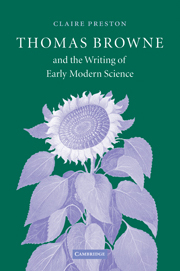 Sir Thomas Browne was an English author of numerous medical, religious, scientific and esoteric works. He was born on the 19th of October 1605 and died exactly 77 years later on the 19th of October 1682. This numerological symmetry seems in his case more of a necessity than a coincidence for it supports his theory on the quincuncial order in nature. In 1658 Browne published The Garden of Cyrus , a book in which he composed a whole discourse upon the significance of the geometric pattern of quincunx in various forms of nature and art. In short, quincunx is arranged of five points, with four of them forming a square (sometimes rectangle) and the fifth one at its centre. “Browne’s use of the quincunx is in certain respects straightforwardly numerological: it is the sovereign number, the middle digit in the sequence of primary Arabic numerals one to nine; it is the ‘conjugal number’, and its Roman form, the V, is half a quincunx which, joined with another, becomes X… the first or fundamental letter of Christ’s name (GC 1, 181), and is therefore associated with generation and regeneration” (Claire Preston, Thomas Browne and the Writing of Early Moder n Science). In his book, Browne recounts Cyrus the Great, the founder of the First Persian Empire and the alleged creator of the Hanging Gardens of Babylon. According to Browne, Cyrus was: “Not only a Lord of Gardens, but a Manual Planter thereof: Disposing his Trees like his Armies, in regular Ordination.” (Sir Thomas Browne, The Garden of Cyrus ). 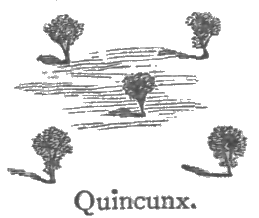 As noticed by Browne, quincunx pattern creates regularity and order which gives the trees enough space for growth and healthy vegetation. “When Jung looked attentively at the four figures surrounding the ‘indifferent drowning person’, he noticed the 3 + 1 structure. It is a pattern wherein one figure is clearly different from the three comparable others, whereas together they unmistakably form a foursome. Jung wrote extensively about this type of quaternity. It is an essence theme in alchemy in particular. Jung always attested that the Christian trinity needs a fourth figure; the dark unconscious function which Christianity repressed as devilish. In his view, the Christian trinity is perfect, but not complete. The fourth function is lacking, that is, the unconscious. Christian theology repressed the instinctive, dark factor. In Tanguy’s painting, Jung saw this fourth function in the shape of a flame. He figured that Tanguy painted a “developed symbol of totality”, stemming from the ancient Gnostic quarter-unity of the godhead Barbelo. Exactly this perfect quaternity produces the fivesome, the quincunx!… Jung saw Tanguy’s painting as ‘great art’ because this painter did not depict only disorder, but at the same time archetypes which ‘express order’. “ (Tjeu Van den Berk, Jung on Art: The Autonomy of the Creative Drive ). Sir Thomas Browne’s partially scientific partially philosophical analysis on quincunx and his numerous other works have not been particularly well known. This is a paradox indeed, as Browne is one of the most influential writers in the history of English literature and if not for his input into science and literature then he should be at least remembered for introducing into English language (among a few hundred other words) the two words the modern world could not simply go without – ‘electricity’ and ‘computer’. I am sceptic about his claims of a paradigm to nature though. Because I have attempted to do the same thing – computational/mathematical model of cell division, growth. These models can, at best, be used to evaluate existing evidence i.e have we gathered all facts?